WASHINGTON (CNS) — Catholic leaders cautioned that federal spending must safeguard the common good after the White House released its fiscal year 2019 spending plan that boosts military spending and cuts human services, environmental protection, diplomacy and international humanitarian assistance while assuring that the budget deficit will grow over the next decade. The chairmen of two U.S. Conference of Catholic Bishops’ committees joined Catholic Relief Services, Catholic Charities USA and Jesuit Refugee Service/USA officials in expressing concern that the proposed budget disproportionately cuts programs assisting the poor and elderly, placing human life and dignity in danger. The White House plan, “Efficient, Effective Accountable: An American Budget,” proposes slashing federal spending by billions of dollars on food stamps, federal housing vouchers and health care for the poorest Americans even as defense spending would rise by tens of billions of dollars. The proposal from the Office of Management and Budget at the White House cuts $17.2 billion from the Supplemental Nutrition Assistance Program, formerly known as food stamps, and more than $1.1 billion from Temporary Assistance for Needy Families. It eliminates the requirement to expand Medicaid under the Affordable Care Act and caps the amount of money states receive for the program. It also widens work requirements to receive federal assistance in some cases. Others set for elimination include the Community Development Block Grant ($3 billion), Community Services Block Grant ($715 million) and Low Income Home Energy Assistance Program. ($3.4 billion). Overall, the proposal eliminates 66 programs for a savings of $26.7 billion. The cuts are in line with President Donald Trump’s campaign pledge to reform the federal government and reduce the federal workforce. The budget proposal also serves to acknowledge that the $1-trillion tax reform law passed in December will spur long-term deficits that will not be offset by projected economic growth. “Budget decisions ought to be guided by moral criteria that safeguard human life and dignity, give importance to ‘the least of these’ and promote the well-being of workers and families who struggle to live in dignity,” Bishop Frank J. Dewane of Venice, Florida, chairman of the Committee on Domestic Justice and Human Development, and Archbishop Timothy P. Broglio of the U.S. Archdiocese for the Military Services, chairman of the Committee on International Justice and Peace, said in a Feb. 13 statement. 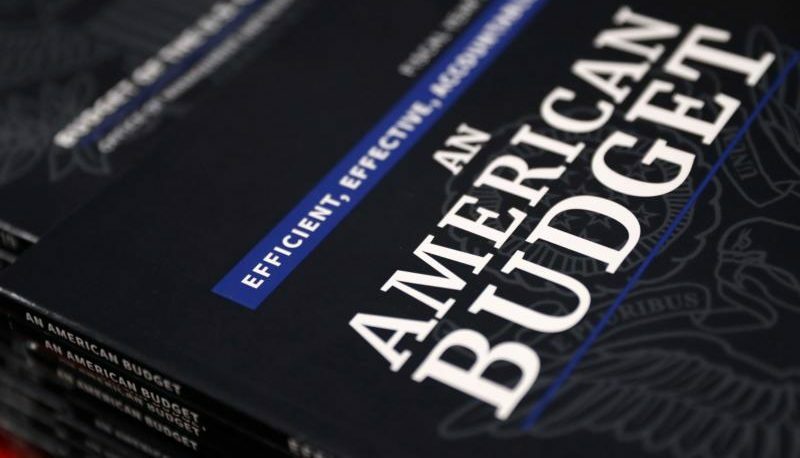 The White House budget is unlikely to be adopted. Congress adopted a two-year budget plan as part of the latest stopgap spending measure passed early Feb. 9 after a brief government shutdown. While the measure only funds the government through March 23, it included a broad spending outline covering two fiscal years. It kept social services spending largely intact while giving the president his much-desired increase in funding for the armed forces. Congress still must write an omnibus spending bill to keep the government in operation through Sept. 30, the end of fiscal year 2018. Congressional observers believe lawmakers will continue to stay the course and only tweak federal spending especially in an election year when every seat in the House of Representatives and one-third in the Senate are on the November ballot. Even so, the prospect of having to defend vital human needs funding from cuts in the face of more military spending is troubling to leaders within the social service and humanitarian aid fields. Bill O’Keefe, vice president for government relations and advocacy for CRS, said that the agency’s concerns center primarily on the administration’s proposal to reduce funding for international humanitarian aid, especially the elimination of food assistance. While Congress is expected to write its own budget plan that funds key aid programs, uncertainty remains in what the amount of funding will be, he told Catholic News Service. “(The agencies) know that Congress is going to reject the budget, but they’re hearing from the administration that this is the budget,” O’Keefe explained. “The last time we saw that some part of the government acted as if the president’s budget was going to be the budget. Other parts of the government acted with knowledge that Congress was going to overturn it. That created uncertainty and inconsistency. “Helping people in communities requires that when you say the funding is going to be there, then it’s going to be there. Relationships depend on trust and trust depends on reliability. This undermines that trust,” he said. “Fortunately a bipartisan consensus in Congress is well aware that as the richest country in the world we have a responsibility to help the more vulnerable,” he added. Giulia McPherson, interim executive director at Jesuit Refugee Service/USA, told CNS the agency’s focus will be with Congress to pass a spending plan that holds the line on international humanitarian funding, which makes up about 1 percent of the federal budget. Under the administration’s budget, the Department of State and U.S. Agency for International Development would see more than 30 percent of their allocations slashed. McPherson worries that the Trump budget signals to the world that the U.S. is withdrawing from its long-held leadership role in providing humanitarian assistance to refugees and forcibly displaced people. “The U.S. historically has invested in these kinds of programs and has demonstrated the kind of leadership that brought other countries on board,” she said. Any rollback in funding for international humanitarian and food assistance likely will worsen, not lessen, dangers to U.S. security, she added. Agency representatives such as McPherson, O’Keefe and others know they have a large task ahead with Congress. They told CNS they will press the moral arguments that the church has long made about the importance of protecting the most vulnerable people in the U.S. and abroad.